The Sindry family owned Brooklyn Gardens from around 1890. At that time it covered most of the area where St. Benedict's School is now, and across Princess Elizabeth Way up to Arle Court Farm. The first to settle was Albert H. Sindry and his wife, Mary Louise. Their children, George Thomas, Albert Henry, Arthur Victor, Roy, Hilda, May, and Nora Winifred were all born in Arle. An entrance reached their house, which would have been approximately where the Adult Opportunities Centre now is on Princess Elizabeth Way. They were successful market gardeners. George Sindry was fond of his tipple, but even blind drunk, managed to play the church organs at both St. Marks and Swindon churches. They were not a close family and did not keep in touch with one another very much. He believes there are Sindrys in Australia. Roy Sindry was injured in WW1 and had permanent trouble as a result of his injury, but at least he survived that war, while several men from Arle did not. Roy lived at 'Penarth' in Alstone Lane, and Victor lived in Brooklyn Road. Charles Court used to live on the corner of Brooklyn Road in the old house. The Tapsells later lived there. Mr. R. Sindry remembered the Voice family, and the Woods of Arle Farm. He was born in The Gables, and said that in the back garden of Arle Court Farm, you could see the Elizabethan part of the old house. There was a wall about nine feet high of different thicknesses of brick, inside which the ground was laid out in a type of Tudor garden. Mr. George Sindry lived for a time at Arle Mill between the 1920s and 1930s. Presumably the old Brooklyn Gardens home was demolished in the 1930s, when Western Estates began development, but after the War the rest of the development swallowed up what was left of Brooklyn Gardens. Charles Thomas Voice describes Yew Tree Cottage on the corner of Village Road and what was once Arle Road, where his grandmother lived. He says there was one room downstairs with a pantry in the back. The Post Office was visible through the left-hand window, and leading from the room was a staircase. The upper floor, which also was basically one room with a door on the right hand side, had the left-hand area as an open space. There was a well in the garden which, as a boy, Mr. Voice managed to drop the bucket down off its chain, much to his gran's annoyance. His grandmother is mentioned in 'The History of Hesters Way Volume 1'. Mr. Voice confirmed that she was indeed a bit of a character and very strict. The toilet facilities were a typical 'thunder box' at the end of the garden. He remembers the Pearts' lived next door for a time, where the bungalow was owned by Mrs. Jardine. As a lad he went to get milk from Arle Farm Dairy and he recalls the Fletchers, the Kearseys, the Bromage family, The Morris's and the Cripps. His father's first wife died of the flu epidemic in 1918, and his father was wounded in the War, but later re-married. Mr. Voice's half sister lived in St. Pauls, and he says his grandfather Voice was born in Leckhampton. She had three children, two boys and a girl, but the girl died at nine months. As a boy his grandfather used to go with his father in a pony and cart to Gloucester on Saturday mornings to sell produce at the market. In the Second World War, Mr. Voice remembers clearly that on December 12th 1940, when they were in Burton Street, his father told him the sirens had gone, and he was sitting in a chair when the bombs dropped on Stoneville Street. He was relieved when his mother returned safely from his granny's. It was believed that the gasometer on Gloucester Road had been pierced by a piece of metal which caused the pressure to blow up. This was a near miss for him and his family - not so lucky for the people in Stoneville Street. As a child Mrs Forbes (nee Green) lived in Arle Mill Cottages. There was a field behind the mill and the path to the cottages was rough and unpaved. Like many of the cottages in Arle at that time there was a well in the garden. One day as she was playing by it with her sister, she slipped in but managed to grab hold of the sides. Her sister rushed into the house to get their dad. She told him that Mary had fallen into the well. Fortunately he managed to rescue her but it was a close call, she could have drowned. On Sundays they went on outings to Bishops Cleeve. Her father was a Christadelphian. The Greens were a united family and her brother, Eric, who sadly died recently, used to work for Mr. Wood at Arle Farm. Another brother lives in Australia and recently wrote to Glos. Echo giving his memories of Arle. He was saddened to hear that his school, Red Roofs, had been demolished. The children all went to Gloucester Road School and later to the Central School or Christ Church. A younger brother in later years became a POW in Korea. She recalls Jesse Webb who lived at Box Cottage and she and her sisters played with him. 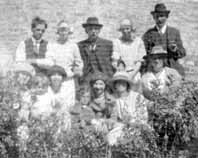 On Sundays they went to Sunday School with a gentleman who would take them through the fields to a wooden building (St. Silas Mission). She knew the Voice family at the post office, and the Booth family, and used to go to school with Miriam Stephens from the row of cottages on Village Road. She also recalls a lady who was crippled and refers to Miss Allen, who later ran the other post office. One memory is very clear, that of Charlie Webb who used to go to the Cross Hands for a 'liquid lunch' and return mid-afternoon to sleep it off under a tree along Mill Lane. Nurse Boston, the district nurse, attended Mary on more than one occasion to treat a grazed and infected knee. One day Mary was wheeling her sister, Ruth, in the push chair along the lane and remembers she was wearing black stockings and knickers when her brother chased her with a live mole in his hands. In her rush to escape, she slipped on the rough patch; the result being a badly infected knee which Nurse Boston came to dress. Nurse Boston also attended her brother who had convulsions, but she didn't call on her when she received a later injury. 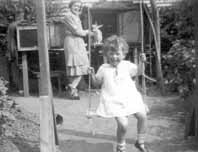 Along with other children she used to go to the King George V playing field on Brooklyn Road. This evidently was not exciting enough, for they used to sneak over the fence into the former Grammar School field opposite, and one day when they were chased off, got her jumper caught in the barbed wire and inherited another scar. The cowman who worked for Jocker Brown came every day into the field behind the mill to take the cows right past their cottage morning and evening, to be milked by hand. Of the Booths, she says one of the sons who owned a cottage by the lane near Maggie Webb's cottage (Tanners Lane) fought hard to keep his property when the Compulsory Purchase was going on, (around 1950) and that Donald Booth had an engineering company at Elmstone Hardwick. She knew Mr. S. Wasley, who was a friend of her father, and that when Mr. Wasley died, he left money to his housekeeper. The only shops she recalls were a sweet shop in Tewkesbury Road and one near Gloucester Road School. There were no local shops, and like the rest of Arle women, her mother had to walk to Cheltenham to do her shopping. 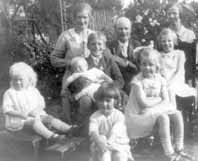 The Peart family came to live at Bank Cottages, Arle, circa 1895 by which time they had 6 children born at Arlebrook, near Standish, and Tewkesbury. They settled in Bank Cottage, rented from Mr. Brown of Arle Court Farm. Four of the sons served in WW1; sadly two did not return. Of the remaining sons, Joseph married Alice Priddy and lived for a time in Arle, as did Albert Peart, father of Audrey. Audrey clearly remembers her neighbour, Mrs. Voice who, despite other less neighbourly comments on her character Audrey recalls as a nice, kindly, old lady who gave her biscuits. The photo above shows Audrey and her mother in the garden of Bank Cottage and she had a story to tell about the rabbit. One day it disappeared from its hutch and Audrey was told it was ill and gone to hospital to be made better. Shortly after Audrey was taken to Delancey Hospital with scarlet fever and on seeing the imposing figure of a nurse, asked if they had made her rabbit better. The reply was curt and to the effect it was probably made into a rabbit pie. What a shock for a sick child! No wonder Audrey recalls it. She remembers many of the Arle Village people and she went to Gloucester Road school and was a playmate of Jesse Webb of Box Cottage. We have the only surviving photo of The Old School House in the background of Audrey (right). Of the large group outside Bank Cottage, Audrey is still trying to identify them all. It is believed to have been taken c. 1919 to 1926. As they are all in their 'Sunday Best', she believes it must have been a special family occasion. The photo of a Peart lady on a tricycle outside The Cross Hands shows a mode of transport rarely seen. One of the survivors from WW1 went to Canada and Audrey is in touch with his descendants.